"Later, when I have departed and entered the kingdom of heaven, if I have completed my task well, and if something remains of all my daily writings, some keen ‘schoolboy’ or hardworking historian will discover it. And some future publication will reveal these forgotten words like a secret. The ideas, hopes, passions and dreams that occupy me, the flood that inundates my thoughts according to the phases of the moon, the vigour which rises in my soul, everything that I record in the fires of ‘cogitation’, and that I bear as a testimony—this whole explosion will one day be nothing more than the flimsy fabric of memories. But my hope and expectation is that the few who have the opportunity to escape the night and ‘land in far away eras’ will testify to an unwavering faith. Faith is like a seed which encourages me to work in both the present and the hereafter, if God wills it. The task now, however, is to construct a land on earth where people, minds and love can grow." An Introductory Note "Domestic Politics". « Plus tard, quand nous serons partis pour le royaume des ombres, si nous avons bien rempli notre tâche, si quelque chose doit demeurer de tant de pages quotidiennes, quelque « écolier » attentif, quelque historien aux veilles studieuses le découvrira. Et quelque publication de l’avenir livrera comme une confidence des paroles oubliées. Les idées qui nous travaillent, les espoirs, les passions, les rêves, toute cette marée qui nous envahit, tel le phénomène lunaire, cette sève qui monte de notre âme même, tout ce que nous écrivons dans le feu de la « cogitation : et que nous livrons comme un témoignage, tout ce déchainement ne fera plus tard que la matière transparente d’un souvenir. Propos liminaire « Politique Intérieure ». 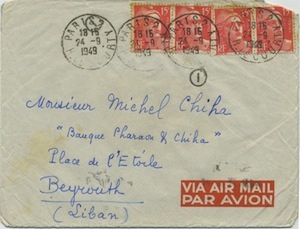 In 1919, after a three-year exile in Egypt, Michel Chiha returned to Beirut at the end of the Great War. 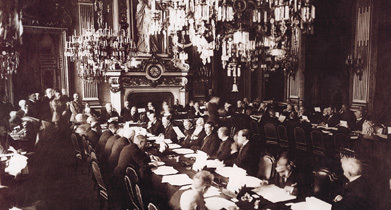 He took over the running of the Pharaon and Chiha Bank (Michel’s father Antoine passed away in 1903 having co-founded the Pharaon and Chiha Bank in 1876) at one of the most difficult times in his country’s history. A nation-wide famine had decimated a quarter of the population and one-fourth of the country’s homes were in ruins.